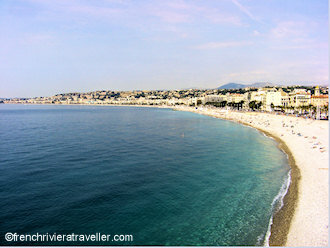 There are public beaches in Nice all along the Promenade des Anglais--22 in all. 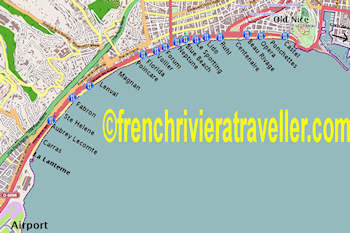 (See a map below) In addition, there are 15 private beaches in Nice interspersed among the public beaches. On the private beaches you pay for a lounge chair, umbrella and towel (if you like). The price for all three is about €30 a day. Each private beach has a beach restaurant and private facilities. Below is a map and description of all the public and private beaches between the port and Nice Airport. A little further east is the Cap de Nice and Coco Beach. See more detailed information on all Nice beaches, beach restaurants, public beaches, private beaches and the best beaches in Nice. Home of Castel Plage beach restaurant, this beach is nestled under the Chateau. There's a wide stretch of beach and the water is often slightly calmer than elsewhere on the Baie des Anges. To the east of Castel is the very basic and tiny Bains de Police. More. Prefer to swim in front of lifeguards? This is the place. There's also a first-aid station and a fenced-in, sandy beach volleyball court. More. It's right in front of Nice Opera and part of the beach is reserved for the private Opera Beach restaurant. At the western end of the beach is Nikaia Water Sports where you can rent equipment to waterski, parasail, canoe, kayak, raft and more. More. Across the street from the Beau Rivage Hotel, the Beau Rivage beach restaurant is a nice place to kick back and sip a frothy cocktail under a parasol. Anyone can use the public restrooms, showers and bag storage for a small fee. Enter on the Promenade. There's also a lifeguard and first-aid station. More. This beach spans the Paillon river estuary so it's best to avoid swimming if there's a lot of muddy river water pouring into the sea. Otherwise, this beach is noted for handicapped access. There's also a lifeguard,first-aid station and public toilets and indoor showers (beach entry). On the eastern end of the beach is Le Galion beach restaurant. More. Trendy Hi Beach beach restaurant takes up part of Forum beach and offers massages and relaxation areas. Also on Forum beach is a first-aid centre and lifeguards. Outside Hi Beach there are public toilets, showers and left-luggage facilities (entrance on the Promenade). More. It's the home of the La Voilier beach restaurant which has a bustling nightlife during the summer season. More. It's the home of the Florida beach restaurant which boasts a jacuzzi and is famous for its evening parties in the summer. More. Now you're getting farther west where the beaches are less crowded. More. There's a first-aid station and lifeguards here. Magnan beach spans the tiny Magnan river which brings junk into the sea after strong rains or a storm. In that event, it's wise to move a beach away until the sea clears. More. Across from Lenval Hospital, this beach attracts a primarily local crowd. More. Fabron beach contains two beach restaurants: Bambou on the eastern end and Miami to the west. They are smaller and less elaborate than the beach restaurants closer to town. Also at Bambou Beach are public toilets, indoor showers and left-luggage facilities (entrance on the Promenade). More. Here is where you'll find the Regence beach restaurant, across the street from the Hotel Radisson. More. There's no beach restaurant here but you can go one street in and on ave de la Californie there are a number of good sandwich places. More. You can watch the planes taking off and landing as this is the beach closest to Nice Airport. There's also handicapped access, a first-aid station, lifeguards, beach volleyball and Jet Evasion which rents jet skis. There is wheelchair access. Nice beaches are off-limits to dogs but just west of Carras at Site de la Lanterne, there's a tiny beach where you can let Fido cut loose. More.